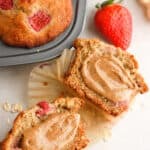 Healthy and easy recipe for strawberry banana muffins! 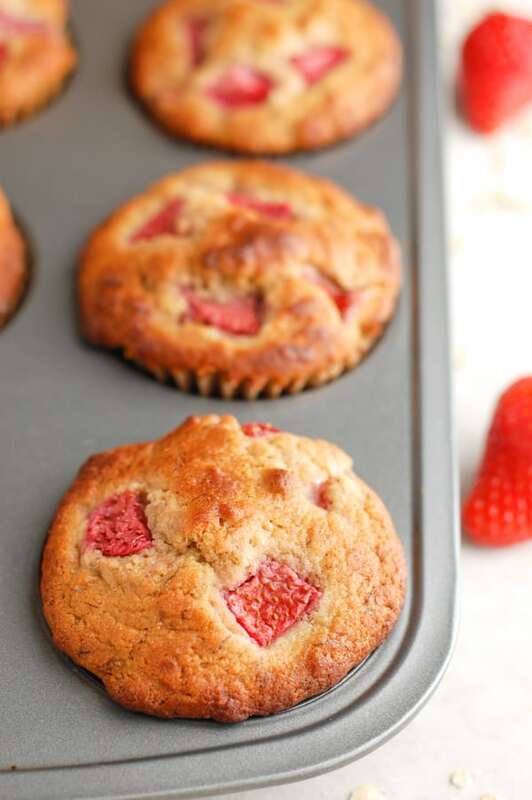 They are perfectly moist and fluffy, have no added sugar, and are made using fresh strawberries! They are the best whole wheat muffins! Strawberry banana has long been one of my favorite flavor combinations. Being a huge fruit lover, I always thought that the sweet and tart flavors from the strawberries paired so nicely with the creaminess of a banana. Everything from strawberry banana smoothies to strawberry jelly and banana sandwiches, I was always finding ways to make this combo shine. So I set out on a mission to make a delicious muffin using two of my favorite ingredients. 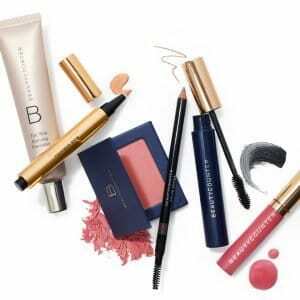 Are you a busy worker who finds themselves rushing around the house in the morning trying to get out the door? Because I definitely am. I’ve found that by prepping my breakfast ahead of time, it makes it so much easier for me. 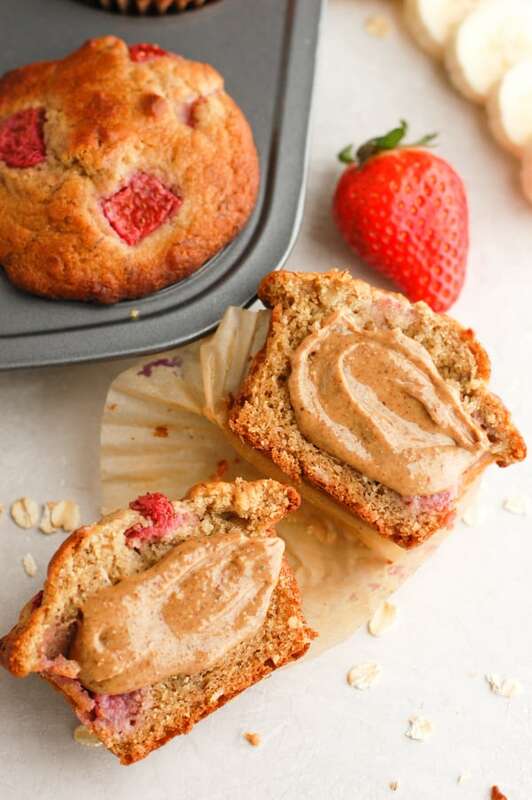 By taking the time on Sunday to meal prep a bunch of strawberry banana muffins, it makes my mornings that much easier to just grab one and take it on the go. And I know what you’re thinking, can muffins really be healthy enough for breakfast? 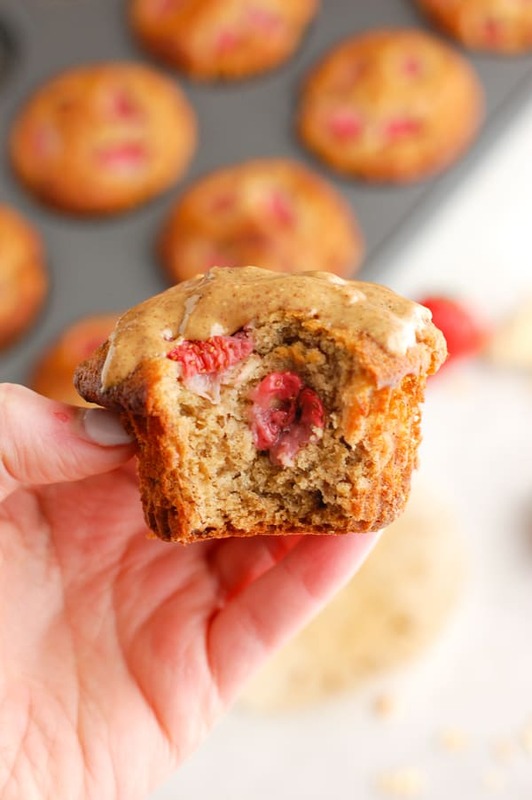 What are in strawberry banana muffins? Whole wheat flour – I chose to use whole wheat flour for this recipe just to mix it up and get the most soft texture possible. I have plenty of other paleo muffin recipes on my site! Ripe Bananas – the riper, the better! I love baking with bananas that are as brown as possible because this means that they are extra sweet. Fresh strawberries – I used fresh strawberries, I think they work better than frozen and just love the brightness from fresh fruit. 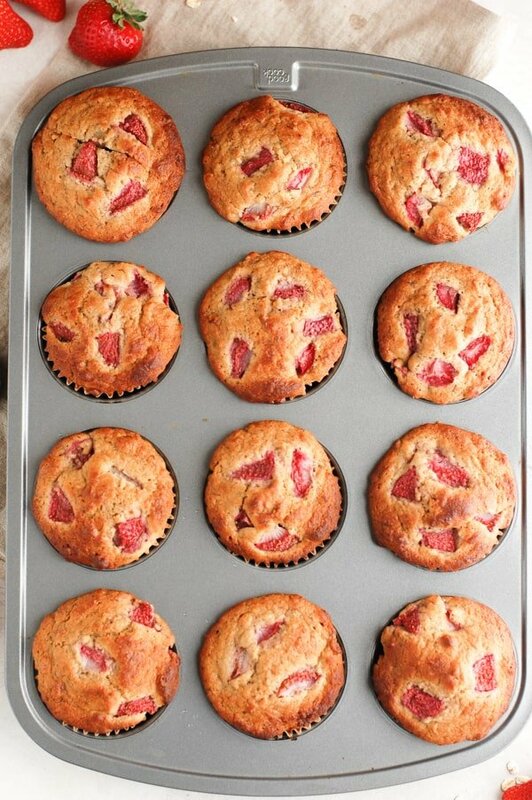 Yogurt – I used plain Greek yogurt here and it really helps give the muffins a light and fluffy texture. Honey – a little extra sweetness to help the muffins! Honey is one of my favorite natural sugars. Coconut oil – my favorite type of oil to bake with. If you don’t want a slightly coconutty flavor, be sure to buy refined coconut oil, as it will get rid of that taste. 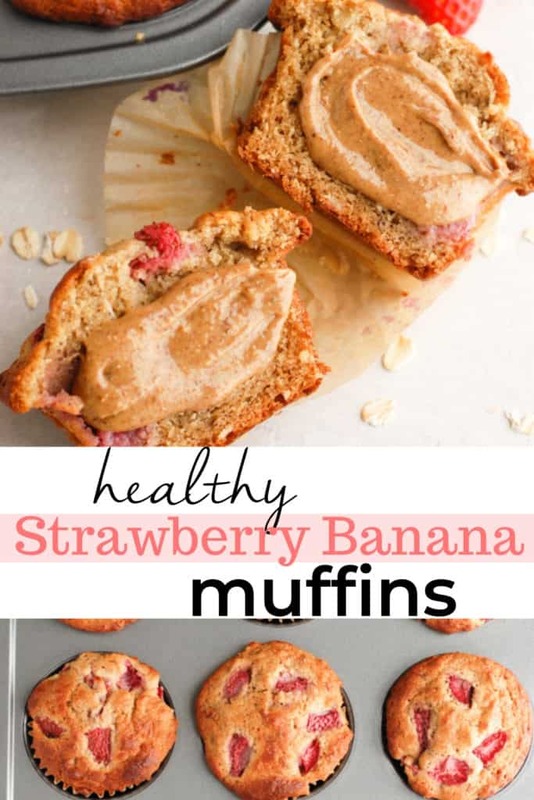 How long do healthy strawberry banana muffins last? If you don’t manage to eat them all on the first day, you can just pack them into a tupperware container or wrap them in aluminum foil and keep them room temperature on the counter for up to one week. You can also freeze these for a later date! Just wrap them up tightly and stick in a ziplock bag and freeze! If you make this recipe, be sure to comment below and let me know how it was! Also tag @erinliveswhole on Instagram and use the hashtag #erinliveswhole so I can see it and feature you! Here are some other similar recipes that you may also like! Preheat oven to 375F and prepare muffin tin with spray or liners. In a small bowl, combine flour, baking powder, baking soda, cinnamon, and salt. In a large bowl, mash bananas until smooth. Whisk in eggs, coconut oil, honey, yogurt, and vanilla until combined. Fold in flour, careful not to over- mix. Fold in strawberries and only stir a few times. Use an ice cream scoop or measuring cup to scoop into prepared muffin tin. You most likely could! I would add another egg, and use 2 cups total. Might be a good idea to follow the recipe guidelines for my Paleo Banana Bread muffins.